We love hearing and seeing the projects you’ve created in EQ. Even more, we love it when EQ users are sharing their patterns, blocks, and tips with each other! Suzy Prickett is one of those users and she’s very enthusiastic about sharing! Check out her recent EQ designed table runner, Flowerburst. 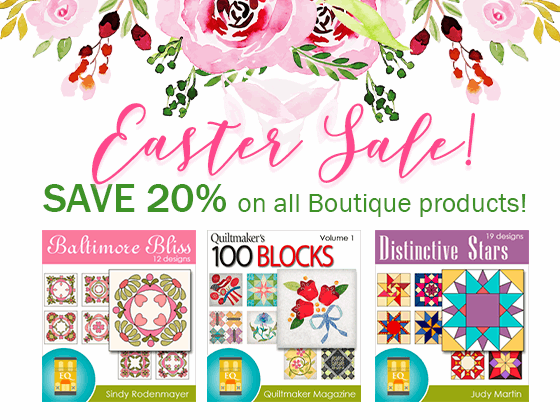 She’s made her original block design available for you too! Suzy is a great student too. We read that she has been keeping up on her EQ6 Appliqué Drawing Lessons and experimenting with drawing herself. Here are two blocks she’s finished. One is from an EQ lesson and the other is her own arrangement. Great work, Suzy. To see more of Suzy’s EQ creations visit her blog posting “EQ Fun”. She done some beautiful quilts!